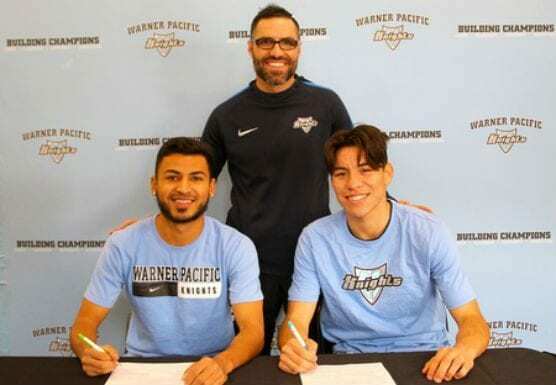 Former College of the Canyons men's soccer players Jorge Rojas, Cesar Dominguez and Jose Luis Ruiz (not pictured) have signed on with the men's soccer program at Warner Pacific University in Portland, Oregon. | Photo courtesy WPU Athletics. A trio of players from the Cougars’ historic 2018 conference championship team will now have the opportunity to continue their playing careers together at the next level after committing to Warner Pacific University. COC sophomore forwards Cesar Dominguez and Jorge Rojas will be joined by sophomore midfielder Jose Luis Ruiz as the newest members of the WPU men’s soccer program. All three players have already started working out with the team and will be enrolled at their new institution for the spring 2019 semester. Warner Pacific University is a National Association of Intercollegiate Athletics program located in Portland, Oregon. The Knights will be led by third-year head coach Troy Heady in 2019, while competing in the Cascade Collegiate Conference. Dominguez earned Western State Conference (WSC), South Division Player of the Year after leading the Cougars and ranking seventh in the conference with seven goals. His 24 points across 19 games, including 16 starts, also led the squad. Dominguez tied for the team-lead with four assists, while his 45 shots and 23 shots on goal ranked second for the Cougars. The Valencia High School graduate, who also earned All-WSC First-Team honors as a freshman, finished his Cougar career with 16 goals across 38 games. Rojas also played a key role in the Cougars’ championship run, scoring nine goals and adding four assists to finish right behind Dominguez with 22 points. The sophomore, who attended Kennedy High School, was named an All-WSC First-Team honoree. Ruiz was named to the All-WSC Second-Team after playing in 16 games for the Cougars in 2018. Canyons won its first WSC championship in program history after finishing the regular season with a 10-6-3 overall record and a 7-2-1 mark vs. conference opponents. COC also returned to the postseason for the first time since 2010 before seeing its season come to an end vs. Mt. San Antonio College in the first round of the California Community College Athletic Association (CCCAA) Southern California Regional Playoffs.